There are hundreds of different combinations of ingredients served in bars around the world, but no cocktail bespeaks sophistication and elegance quite so much as the martini. Of course, there are almost that many opinions about what constitutes a proper martini. James Bond, for instance, famously insisted that his martinis be “shaken, not stirred.” Those who favor the opposite — stirred — claim that shaking the mixture “bruises” the gin, which seems to mean that the gin tastes more bitter. 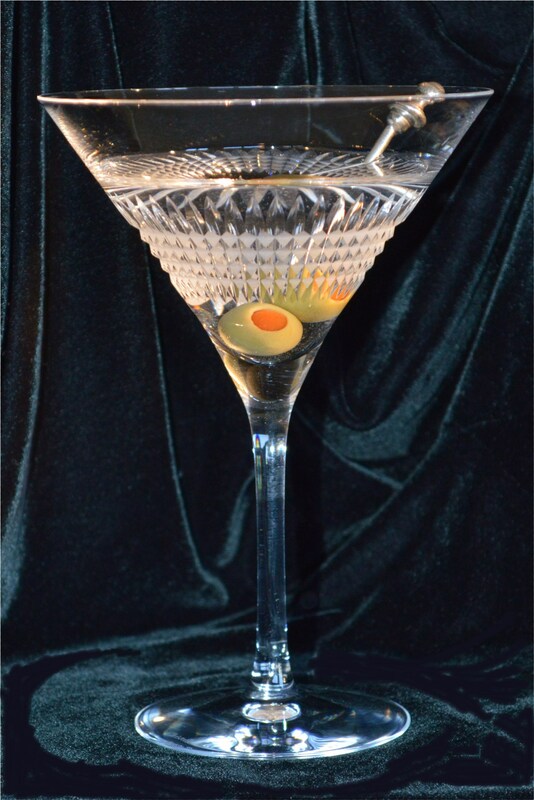 The “shaken” people retort that their preferred method gets the drink colder; “stirred” people begrudgingly agree, but claim that shaking a martini makes it look cloudier in the glass, due to air and ice fragments. Martini enthusiasts on both sides of the shaken/stirred debate would agree that what James Bond drank was not a martini, because he ordered his with (shudder) vodka. Purists are adamant that a true martini is made only with gin — well, and some dry vermouth, garnished with an olive or two, or with a twist of lemon peel. Who invented the drink, and when, is also the subject of controversy, but it’s safe to say that eloquent toasts have been made with raised martinis since the early 20th century. They gained popularity in the U.S. during Prohibition (1920-1933) partly because bathtub gin was in more plentiful supply than other kinds of booze. The recipe for a martini in its introductory phase called for — brace yourselves, drinkers; this might trigger your gag reflex — one part gin to one part vermouth. By the 1950s, the gin-to-vermouth ratio was commonly 3 to 1. That’s how it would be served in a bar unless the customer specified otherwise. A variation on that recipe, according to authors William and Mary Morris, was the one favored by Alfred Hitchcock. He supposedly combined a well-chilled glass, five jiggers of gin stirred with ice, and a bottle of extra-dry vermouth, which he tapped lightly against the cocktail shaker three times. If you’re not into vermouth — and clearly, almost no one is — it’s a fortified wine (additional alcohol added) that is flavored wtih herbs and roots and shrubs and whatnot. In the context of vermouth, dry is an antonym for sweet, not wet. There is such a thing as sweet vermouth, incidentally; it’s used in Manhattans, another popular cocktail. The leading international brand of vermouth is Martini & Rossi, which may have contributed to the misunderstanding in Florence, Italy, when my wife ordered a martini. The waiter came back with an old-fashioned glass… yeah, you’re way ahead of me, aren’t you? It was filled with Martini & Rossi vermouth. Although she managed to drink it, it sort of left Sally feeling shaken, not stirred. This entry was posted in Dining and tagged gin, James Bond, martini, vermouth, vodka. Bookmark the permalink. When we ordered martinis “about five to one” in Greece each came back in a tall glass with a long strand of lemon peel and five parts vermouth, one part gin. I didn’t try that again. As popular as martinis are in the United States and Great Britain, there are parts of the world where they still seem to be only a rumor. The one that grosses me out is the “dirty martini.” A friend used to order them until I told her the olive juice is just poured straight from the olive container on the bar, which countless fingers have touched. Sick! Hence the use of the adjective “dirty”, perhaps.